Pioneers in the Atlantic states started working with patients and horses: re-education, rehabilitation, riding for the disabled and therapy after 1950 and particularly in the 1960-1970s. A second national conference took place in France (Hubert Lallery) in 1972. H. Lallery officially announced international attendance at the end of the conference, for the next conference. PD Jurg Baumann with the title: Rehabilitation Through Riding – Riding Therapy (with emphasis on the therapy). The term hippotherapy (Professor Kaser/Ursual Kunzle) was used in conjunction with orthopaedic, neurological and psychiatric problems, but the therapeutic riding school (Zinke) also had a slot in the program. The congress already achieved a greater response in specialist circles, in Europe at any rate.Therapeutic Riding increasingly became a generic term. had as the main focus: Riding as a Sport for the Disabled. The enthusiastic sporting spirit of even the most severely disabled was very impressive. It clearly awakened an increase in emotional participation and the wish for a continuous means of contact was expressed. Many delegates regretted to have to wait three years for the next congress. 3) Special education using riding and vaulting. 4) Riding and vaulting as a sport for the disabled. The first plans for an international forum appeared. This led to the initiative being formed, which encouraged the organizations of the member countries to send delegates to the next congress, who had the authority to start an international federation. had the title: Rehabilitation Through Riding. The possibilities of rehabilitation and developmentally supportive work with the horse were presented through magnificent performances. Delegates from 12 nations came together and voted in favor of an international organization. The name was agreed: RDI = Riding for the Disabled International. A preparatory executive board was voted in with Dorothee Ames (Can) as the president and Jane Wykeham Musgrave (GB) as the general secretary. Jean Tebay (USA) offered to prepare an initial overview of the training courses for therapeutic riding available in the various countries. Octavia Brown (USA) wished to do the same for a collection of publications on Therapeutic Riding. Dorothee Ames (Can) took over the preparation for further developments for the VI. Congress in Toronto. Jane Wykeham-Musgrave (GB) took over, as a condition of the above, public duties and the collection of constitutional drafts from the national associations. 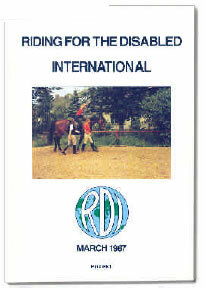 ‘Riding for the Disabled International’ in the first volume 1986 with a dedication by Princess Ann. ‘The formation of Riding for the Disabled International is a landmark in the history of riding for the disabled….’. The contents included a first overview over the activities of the initial member countries, essays by Riede (D); Poulsson (N); Bieber (USA); Peacock (GB) and contact addresses. The second volume from 1987 again was published in the same generous format in color, printed on glossy paper. It contained further reports from Holland, Canada, Hong Kong, France, Germany and Denmark. It had been made possible through donations by the International Fund Sport for the Disabled; Hoechst Pharma (UK); RDA (GB). took place in Toronto (CAN) in 1988 and was particularly geared towards the emphasis of scientific research and its results. Hippotherapy was in the forefront. The promising start of RDI had started to come to a halt. The donors of funds demanded charity status. However the work needed on the constitution, which would have allowed this, was not successful. Numerous wishes and expectations had been sent in, but no useful framework for a constitution. The suggestion to the member organizations of setting up a British charity did not find the necessary approval. Further donations failed to materialize. The urgent requests caused the Deutsche Kuratorium fur Therapeutisches Reiten (Hoffmann, Kluwer, Riesser, Wolf) and the Association Nationale Belge de Therapie par Equitation (Nuyttens) to each produce a draft constitution. These were sent out and discussed in detail at the delegate’s meeting in Toronto (1988), shortened and passed. The executive board was voted in according to this constitution. to take place in London on 15. September, 1990. The delegates asked a small task force, after careful discussions, to prepare the constitution for international agreement. present an integrated constitutional draft for discussion and agreement. Norma Pearce had actually been sitting at the typewriter until the last minute to this end, whilst the disabled riders competed in the championship in the centre of Vilhemsborg. Our inquiry found Belgium to be the only country, which gives international organizations charitable status. This law had been passed by King Leopold III after the first world war and renewed by King Baudouin after the second world war. We only needed to adjust our constitution in a few minor points. The Belgian advocate Jan De Buck was the intermediary with the Belgian authorities. The constitution was discussed as a whole, and in individual paragraphs, and finally passed at the meeting of the International Council, held within the framework of the VII. International Congresses for Therapeutic Riding in Aarhus. The Belgian king authorized the charitable status of the federation, to be called FRDI from now on, as a legal entity, counter signed by the ministry of justice. The next task was then to set up a permanent head office. Jean Tebay published a job description for the position of General Secretary, i.e., for the head office. The bibliography was continually updated by Barbara Teichmann-Engel (USA) and the index of training by Octavia Brown and Jean Tebay, through the use of new editions. The second main task was to publish an ongoing information newsletter to aid communication within FRDI. Jenny Baillie, that is the General Secretary, The Honorable Mrs. P. C. Baillie, did this with great finesse and success. The appearance of our publication changed to increasingly impressive designs. , underlined amongst other items increasingly the developments in the psychological and educational area of therapeutic riding. The members experienced much of New Zealand’s culture and even an invitation to a Maori village. Since this congress an annual journal has been published with the papers presented at the last congress and newer contributions from international literature on therapeutic riding. The publisher for the first three volumes was Gillian Lawrence (CAN), then Olive Webb (NZ). Council elections took place during the international council meetings at every congress, since the constitution stated that council members could only stand for a second term. Norma Pearce returned to Australia after this term. She took over the publication of the newsletters and the running of head office from Jennifer Baillie. , had the spirited title: Riding the Winds of Progress and offered a worldwide presentation of achievements. The enthusiastic side shows had a fairground feel. And the head office was moved to Australia. Daniel Goffaux managed to get a donation in the form of a computer system from Olivetti / Brussels. The editors committee (Olive Webb – publisher) was joined by further committees, for medical sciences (Rene Garrigue) and for education and training (Mary Longden). , had the title:Cheval et Differences Lack of Integration, Disability, Differences, Tolerance, Freedom and Autonomy, Integration. The X. Congress was to be held in France like the first one 25 years earlier. The horses of the Cadre Noir were unfortunately in quarantine, but this was made up for by the generous hospitality. By 2003 the electronic network was extended and since the number of member nations had risen to 41, work on a new constitution was started. Doug Denby became the chairman of the committee. had the title: The Complex Influences of Therapeutic Riding. The work has been planned in 9 sections. The history of therapeutic riding was presented for the first time in the fifth section. Numerous national and regional conferences had taken place all over the world during all these years. Only a few examples could be shown. To finish up with a few special solutions, which had to be found. There had always been a problem regarding full membership, where nations had two or more organizations with national importance, which demanded to be represented in the international council. The solution found was that many organizations would be able to become full members, as long as they could show evidence of their national importance, but that every nation would only have one vote, which meant all its national full members would have to work together, to reach an agreement. There had been initial problems with the constitution. It had to be decided whether the federation had authority over its members, or whether it was to be a forum for exchange of ideas, advice, development and information. The decision for a forum type function had already been reached in Milan. 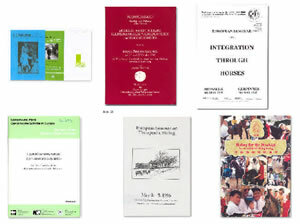 The national organizations had to decide whether FRDI should, from the beginning, stick to an internal only constitution with by-laws and to become part of a larger international organization, e.g. disabled sport, to benefit from other funds, (e.g. from the sports industry). The decision was made for its own independent international organization, for which charitable status had to be achieved because of donations. After a lot of research (inland revenue, German treasury, German UNESCO, Rotary International, European Union, Faculty of Law of Cologne University, Commission of the European Union) only Belgium was found to have legislation which allowed international charitable status. It originates from 1919 and in 1954 was extended from only scientific associations to include philanthropic, religious and educational ones. It only requires the organization to be registered in Belgium and one member of the executive council to hold Belgian citizenship. From a legal point of view everything supports this solution and it has no drawbacks. The financial position was secured through individuals being made associate members with all rights but without active voting rights for the FRDI. These are now able, for instance in Germany, to register their membership fee as a donation for tax purposes. This also applies to other donations made to FRDI. The appearance of publications shows that savings had to be made to enable advances to be made. (in the 50’s it was called ‘satisficing results’ = sacrificing for satisfying). This also meant that the initial multilingual approach had to be stopped. English was the most suitable for the majority of members and organizations, to keep up communication, if these were then passed on by national associations in their own language. As the death of Hubert Lallery caused the loss of the papers from I. International Congress so did the changes in the executive board cause a reduction in the knowledge of the diverse regulations and by-laws. It was agreed in Angers so republish them and to attach them to the constitution. It leaves me with the need to express my thanks for the good team work, the engagement, personal efforts, the wealth of ideas, the ability to make decisions of the initiators, all of which made the development of the FRDI possible.